Keep whitetails coming back! 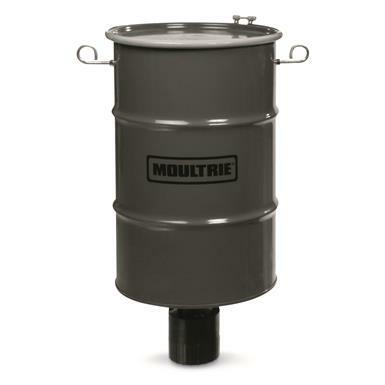 With a smart design that hangs from any rope, chain or cable, the Moultrie 30-gallon Pro Hunter Hanging Deer Feeder makes for easy patterning and healthier herds! Now you can easily and affordably provide a consistent source of supplemental grain or protein during crucial development periods to help maintain a healthy population. The Pro Hunter Hanging Deer Feeder features a digital timer that runs up to 6 times a day. Simply fill with feed, insert your battery, and the Feeder will practically run itself! Of course, you certainly can customize it. You can even regulate feed quantity and customize the feed times... all for a fraction of the cost of similar feeders. Moultrie 30-gallon Pro Hunter Hanging Deer Feeder is rated 2.7 out of 5 by 6. Rated 2 out of 5 by stevehunts from works ok works ok, but requires another $20 funnel to insure feed does not rot around the edges, Also requires another $20 hanger/spreader to suspend rom rope. Rated 2 out of 5 by Rick from A lot to be desired This unit nor the hanging tree hoist come with the gambrel so you can't hang this unit even when you purchase both. Barrel is flat bottom so corn will sit and mildew unless you buy there funnel to go in the bottom for another $25. The lid holds water unless you purchase their plastic top for another $35. This unit should be as good as the plastic version they sell. Rated 5 out of 5 by Bill in Maryland from Was hesitant about buying due to reviews but glad I did The reviews weren't good but I bought it anyway. I experienced none of the issues mentioned and think there may have been some assembly errors on the part of the others. Assembled quickly and worked perfect first time. Glad I made the purchase and would do it again when the need arises. Rated 1 out of 5 by Howard from Don't Buy Looks like a nice unit but does not work consistently. Easy setup. Just doesn't consistently run when it is supposed to. Much wasted time and frustration trying to get this thing to work. One day it does. The next several it doesnt. Customer service is a joke. Find a different product. Rated 1 out of 5 by Fred from Not compatible with advertised pro hunter quick lock feeder. The space between the spinner and the barrel funnel is not close enough. Corn just pours out and drains all before the spinner moves. Rated 5 out of 5 by bravesfan from Heavy Duty Seems to be well made.